SEO Techniques | Advanced SEO Techniques You Should Be Using! 17 Advanced SEO Techniques You Can Use Today! You want to generate more sales, right? Appearing higher in Google’s search results is the answer. Today we’re going to share with you the exact SEO techniques we currently use to generate over 34,400 page views and 2,000 new users per month. The best part is that you can use these strategies right away. 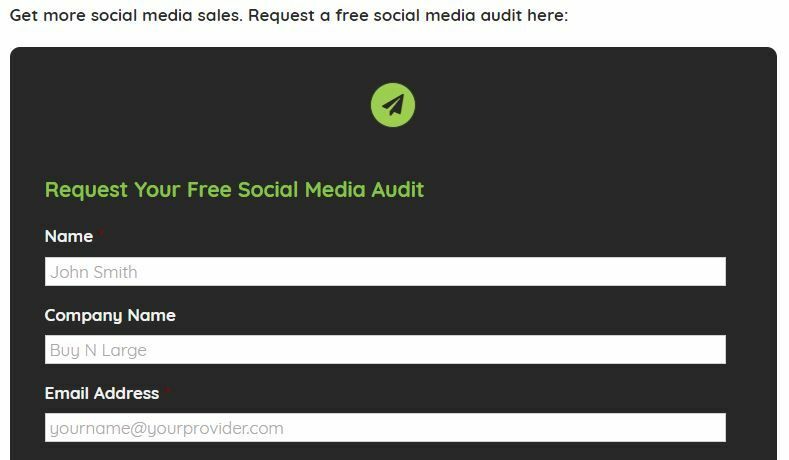 And before you leave, don’t forget to claim your free website audit for a detailed look at your current performance. If you are serious about getting results for your business, you need to optimise for RankBrain. RankBrain is essentially a machine learning software that Google uses to filter results. Of course, there is still an element of human decision making, but RankBrain is the bot calling the shots. So, while optimising using the correct keywords and building up a solid backlink profile is still important, a focus on optimisation for machine learning is a must. So, how do you optimise for a… machine? Good question. If your website gets a high volume of clicks, then it must be relevant, engaging and incredibly popular. This is an indication to Google that you are doing all the right things. People love your site, and so you should be rewarded. But, if people don’t visit your site? Google will drop you! No, literally, you will be dropped from the search engine rankings. This is where creative content writing comes into play. Put yourself in the mindset of your customers. What will encourage them to click? What information do they want to receive? These are important questions that will help improve your click-through-rate. People will see your organic listing before they read your content. It needs to stand out against your competitors. 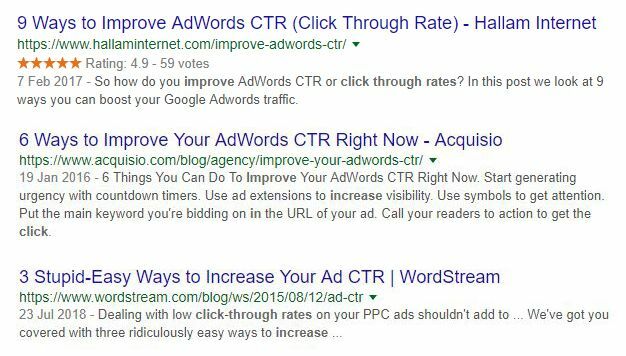 Let’s take a look at this search for ‘improving click-through rates.’ Which search result would you click on? Honestly, you can make a case for any of these websites. Website number #1 has a simple message. However, it does feature a high star rating which draws the eye and encourages clicks. Website number #2 uses the content ‘Right Now’ to instil a sense of urgency. If you don’t click, it makes you wonder, what you are missing out on. As the saying goes, curiosity kills the cat. Website number #3 is a personal favourite. The content ‘Stupid-Easy Ways’ gives the impression that the process is well, easy. People don’t like time-consuming tasks, so this is perfect. Find the perfect meta content comes down to tweaking, testing and tweaking some more. You will never get where you want to be the first time around. SEO takes time. It’s never a quick fix jobbie; you will forever be testing your SEO techniques to generate an ROI. If visitors are leaving, you can assume one of two things. A) Your keyword research is not up to scratch (more on that later). B) Your content is dull. It’s harsh, but true. The better your bounce rate, the higher you’ll rank. One of the ways we have started to improve our bounce rate is simply getting to the point. Basically, people don’t like to be kept waiting. That’s why, you’ll notice, in this post the sentences are short, concise and informative. Getting to the point in the first couple of sentences is essential. You want to be clear on what information you are about to deliver. A second way to improve your bounce rate is to break up your content with headings (H1, H2, H3 and H4). People tend to skim-read and pick out the bits of your article that are of interest. Headings, images and contact forms allow you to break up the content and draw the eye to important elements. Now onto more SEO techniques that we are currently using. Let’s say, you noticed that a post dated November 2003 has started to rank and bring in traffic to your site. Leave it, it’s doing great as it is? Or, improve it? Of course, you improve the blog post. If there’s an opportunity to convert more clicks into customers, then you take it. As an outdated post, you can be certain that new SEO techniques have come to light in recent years. There’s probably tons more value you can offer, too. 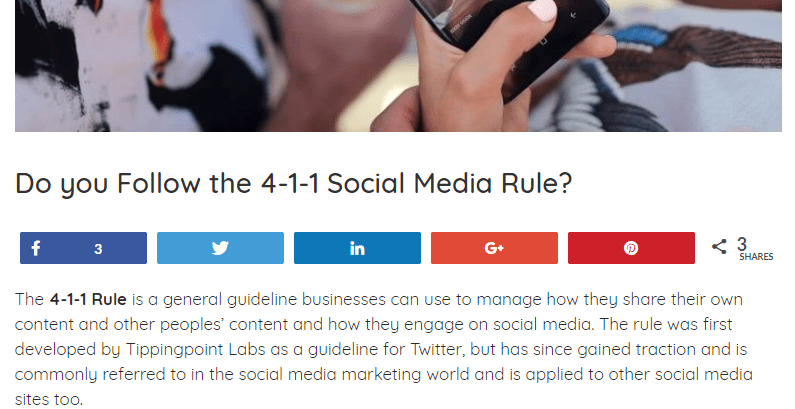 Our ‘4-1-1 social media rule’ post currently ranks position one in the Google results. However, initially, the post held little value. It had no call-to-action or way of capturing data. We re-purposed the content to add an image and a form. Surprise, surprise, we started to notice an uplift in enquiries. Then, you obviously want to encourage more visits to this page (remember, RankBrain). So, you need to start promoting your content externally through social media, newsletters and guest posts. That is a surefire way to increase your conversion rate. As modern SEOs, we know all the tools and tactics in the book. We’ll be honest, most of them are a little on the pricey side. Free alternatives do exist, and this is a perfect example. When it comes to broken links, finding opportunities can be a pain. The Wikipedia editor is designed to flag any broken links as “dead” giving the editors the opportunity to find them quickly. However, it also makes it super simple for you to locate broken links. 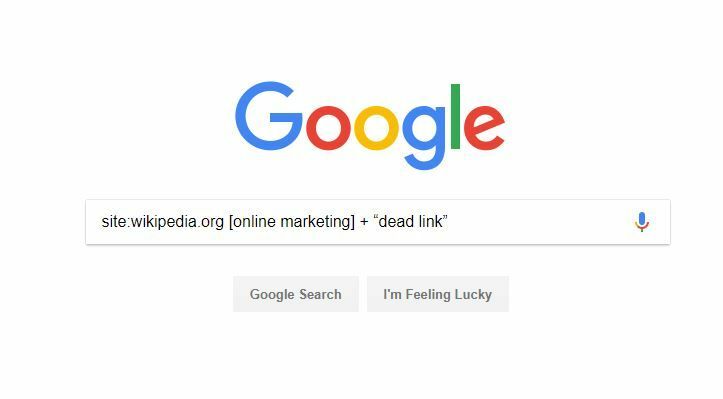 This example shows you results based on the keyword ‘online marketing.’ You can use the shortcut Ctrl + F to search for the term “dead link,” and there you have it. There are many things you can do with broken links. The most popular SEO technique is a little sneaky. But, we assure you it’s safe. Approach websites that have a broken link pointing to a competitor site. Ask them to replace it with a link to a valuable piece of content on your website. You are doing them a favour by pointing it out and offering real value. In return, you will gain the authority and link juice from a powerful domain – win, win! A lot of content isn’t worth sharing. If you focus on SEO alone, your content will fall under that category. While SEO is essential, stuffing keywords into every other sentence is going to harm your conversion rate. 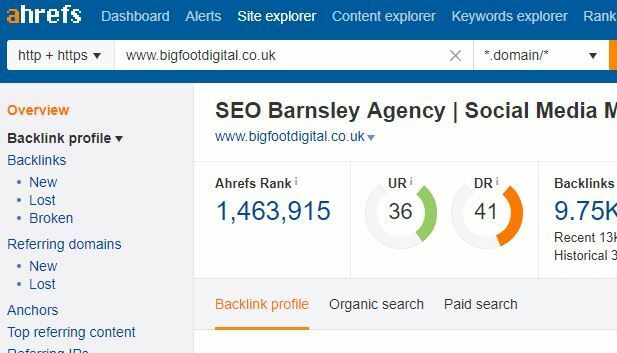 For example, the post you are reading is called bigfootdigital.co.uk/seo-techniques. Because short URLs get more clicks. They are easy to read and seem legitimate. Next, we include social sharing buttons. Notice the social sharing buttons that appear as you scroll down the page? These icons help increase the number of shares you get on social media. It works like a chain reaction. The more shares you get, the more others are likely to share your content. No one likes to be the first to hit the ‘share now’ button. While Google doesn’t count social media shares as a ranking factor, it’s no secret that more shares will bring you more traffic. Some people may even link to your content which can have a positive SEO benefit. These two actions will help boost engagement with visitors while indirectly improving your SEO. These next SEO techniques are focused on actions that will directly improve your rankings. 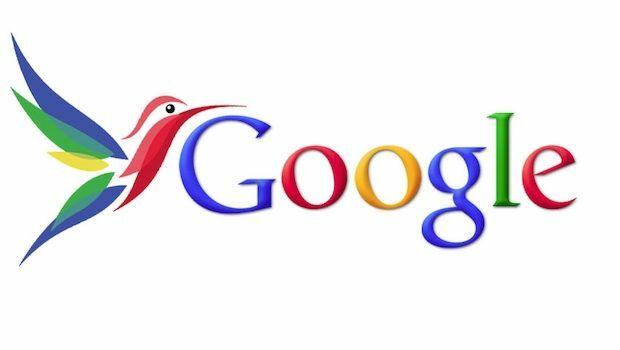 Remember back in 2013 when Google released the Hummingbird algorithm update? Pre-Hummingbird, Google was only able to read the keywords on a page. But thanks to this new algorithm update, Google can understand the TOPIC of a page. The ability to rank websites based on the topic of a page is called semantic search. You start as you’d expect, with a focus keyword. But, you don’t want to optimise for that keyword alone. Look to cover subtopics related to that keyword and include those in your content. You can find synonyms related to your focus keyword using the LSI Graph, which is totally free. We all understand the importance of long-tail-keywords. They help you appear for less competitive terms with a high search volume. But, do you use them in your meta titles? Take a look at the title of this article ‘17 Advanced SEO Techniques You Can Use Today.’ We obviously selected ‘SEO Techniques’ as the focus keyword. Through keyword research, we also discovered that there was a search volume for ‘Advanced SEO Techniques.’ So, we decided to include that long-tail keyword in the title. 7) Make sure your content is at least 1,300 words! Longer-form content is INCREDIBLY powerful. There’s a significant difference between a 300-word article and an ultimate guide with 1,300 words. A recent study proved that the average word count for first page results is 1,800 words. That’s crazy! We understand that writing that volume of content can be overwhelming. That’s a lot of time spent at your computer. The reality is quality content ranks. So, instead of writing an abundance of shorter articles, spend your time working on a 1,300-word masterpiece that will get lots of shares and comments. There are countless SEO tools on the market. What makes Google Search Console special? Unlike many SEO tools, this one gives you accurate data directly from Google. There are a lot of features packed into this tool, so we’ll break it down for you. The ‘Performance’ tab is the best way to find terms you are currently ranking for in the search engines. Some of the terms you may not have considered. There may be an opportunity to optimise your content. This means there is A LOT of traffic potential for this keyword. Looking to advance your marketing using SEO tools? Take a look at our guide to the best SEO tools on the market. This is an advanced SEO technique. If you, like many marketers, find yourself struggling to manage, well… everything, this is the tool for you. If you think about it, marketing is like a funnel. The liquid is poured in the top. In other words, your prospects. Your prospects visit a landing page, subscription page, or something else. Not everyone who visits that page is going to convert. The idea is that you remarket to people based on their actions. At first, you offer tons of value to users with a free resource. You have to gain their trust. Don’t go in with a big sale. Typically, people have to see your brand mentioned seven times before making a purchase. That’s why brands like ‘Coca-Cola,’ ‘ASOS’ and ‘Topshop’ are so popular. They have worked hard to become leaders in their industry. Start your 14-day free trial here! How do we say this without causing offence… if you are on page 2 or 3 of Google, you might as well be invisible. You know yourself, when you perform a Google search, you don’t venture past the first page. How can you give yourself a boost to page one? One SEO technique we use all the time is internal linking. Look for pages with an average search position between position 11-30. If you are getting clicks for a page in these positions, you can be sure for a keyword with a high search volume. This means it’s an ideal keyword to push. You can easily find pages on your site that will pass the most authority to second-page content. From there, you can search by ‘Best By Links’ to find your most authoritative pages. Finally, point links from authoritative pages to the landing page that needs a boost. This is a personal favourite of ours. Use the word ‘currently’ in your marketing messages as proof that your services are worth an investment. The success rate is honestly crazy, especially if you are sharing a guide or resource. The person receiving this knows the information provided is based on tips we currently use. They are reliable, trusted and of value. After all, no agency is going to practice SEO techniques they don’t believe in. And, in case you are one of our LinkedIn connections, we can assure you that everything we share is 100% accurate. Using branded anchor text is a trusted SEO technique. Presumably, this anchor text will be surrounded by content about our services: SEO, social media and website design. Because Google now understands topics (see above), it will associate your brand with these services without needing an exact match anchor. You can always extend your anchor text to ‘Bigfoot Digital Marketing,’ or ‘SEO Experts at Bigfoot Digital.’ It all comes down to variety. 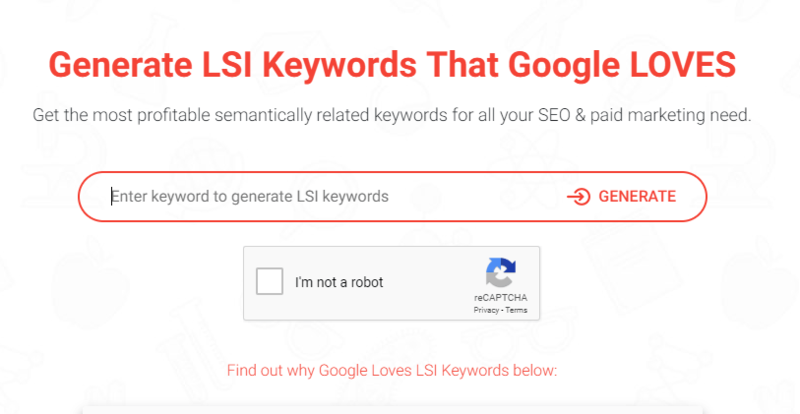 A) You can do your own keyword research using the likes of Ahrefs and Google Keyword Planner. B) You can piggyback your competitors. 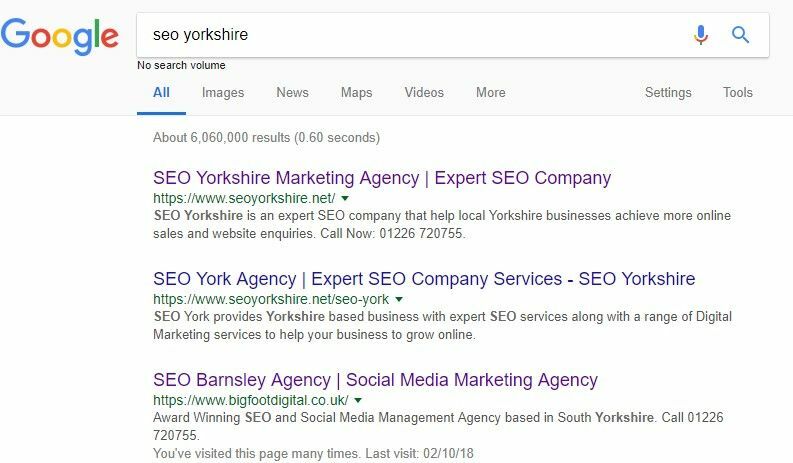 Both SEO techniques work a treat. We tend to lean towards the second options as it’s super simple. The work is already done for you. Find a competitor who is ranking well in the search results and who is pushing similar content to you. Clicky Media is a good example. Next, pop their URL into SEMRush to find a list of their top-ranking keywords. Of course, they will rank for their brand name – ignore this. However, some of these keywords may be low competition which is great news. They may be relying on a large number of backlinks to secure those top positions. 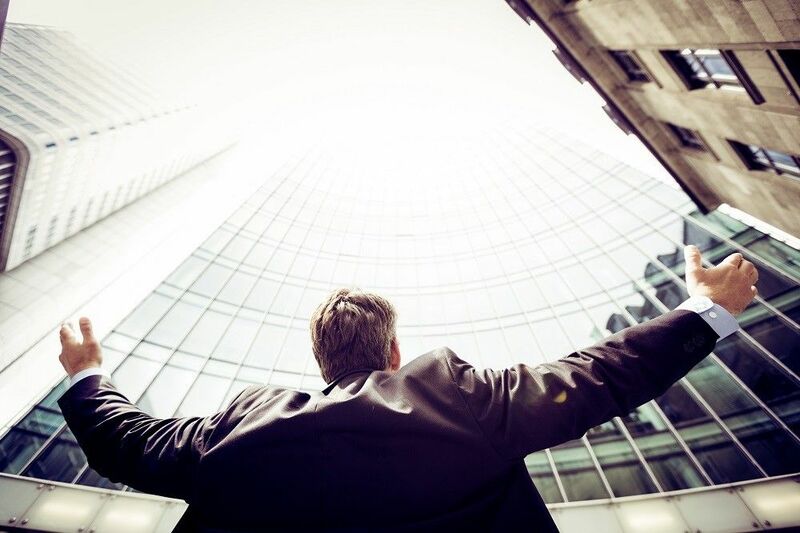 Get your on-site SEO on point, and you’re on the way to knocking them off the top spot. When you stop seeing others in your industry as competitors, great things happen. Let’s say, you are a wedding photographer looking to improve your visibility. Starting a joint venture with someone in your industry is going to massively increase your enquiry rate. Wedding venues, cake makers and bridal boutiques are great places to start. It works in the same way as a referral does. You recommend them, and they will return the favour. Be sure to do your research, though. You don’t want to recommend a business with a shoddy reputation. That will have a knock-on effect on your business. Writing great content for your website is no longer enough. You need to make sure content is supported by a strong internal linking structure. 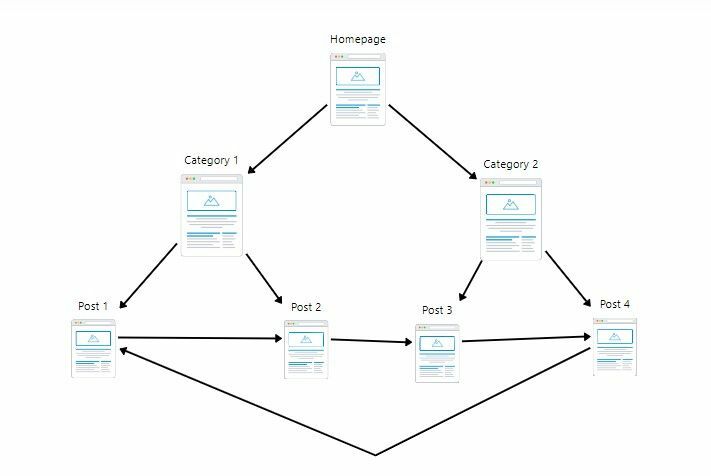 There are two benefits of internal linking. If you start linking to old articles from new ones, then you are offering readers more value. More articles to read – more stuff to learn. Once you start linking from one article to another, you will notice a real SEO benefit. Your traffic will explode, and your rankings will hit the roof. It’s all about strategy. Most websites have multiple service pages that branch out into sub-pages. Those sub-pages are connected in a way that uplifts your service pages in the search results. If your website has a strong internal linking structure, the Google crawler has an easier time finding content and making connections. No SEO techniques list would be complete without a mention of local search. There are two main areas of optimisation, which include national and local. For most businesses, optimising for local offers a bigger boost. Local SEO helps to align the three most important purchase decisions: time, convenience and motivation. It positions you in front of customers on your doorstep. So, how do you optimise for local search? For local SEO, the first task is to get listed in Google My Business. Make sure this information is as detailed as possible with links to your service pages, categories and photos. When adding your website to online directories, make sure you keep the name, address and phone number (NAP) consistent with your Google My Business listing. This is an incognito search for ‘SEO Yorkshire.’ We own all three of the above sites. SEO tracking is essential for evaluating the success of your site. After all, if you’re going to invest your time and budget into SEO, then you want to make sure you are getting the best results possible. The question then becomes, how do you measure SEO performance? The best part of SEO is that you can measure any part of your marketing. 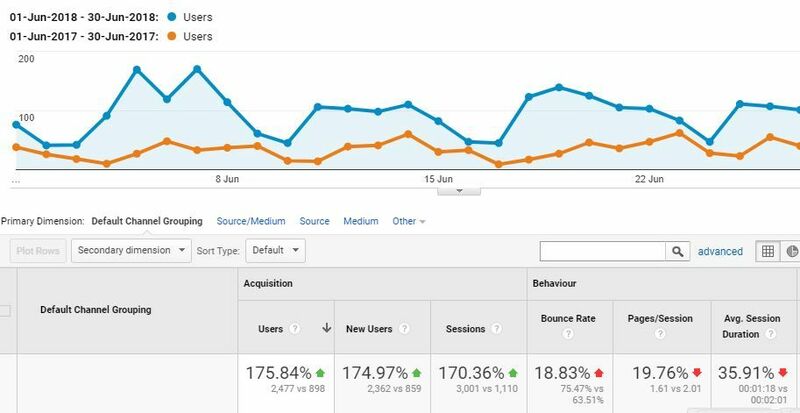 Tools like Google Analytics help you monitor metrics like conversion rate, website clicks, page views and bounce rate. There are many ways to use Google Analytics. Once you get started, it’s hard to stop. You can discover all sorts of things about the behaviour of site visitors. Do they stick around to consume your content? If so, where do they go next? Do they convert or do they click off? These are just some of the questions that will form your strategy going forward. Finally, we have an amazing offer for you! 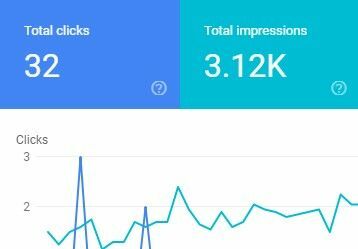 If you have got this far, you are clearly interested in SEO techniques. In fact, we’re willing to optimise the entire performance of your website and give you some pointers. This professional audit is worth £800 – we’re giving it to you free! Simply enter your details, and we’ll be in touch. Terms & Conditions: Following the completion of this form, a member of our Senior Account Management team will be in touch to discuss your professional audit in detail. The audit will only be available to legitimate companies looking to scale their business through digital marketing.